Adobe Flash Player is basically a multimedia platform and supports various formats such as MP3, FLV, PNG, JPEG, and GIF. It is basically a plugin on a web browser and also works on mobile devices. In the next section, we will see how to enable the plugin on a browser. First of all. you need to ensure that it is downloaded and installed properly on your Windows PC. After that, it is updated to the latest version or not. Here, we are going to discuss steps to enable the Adobe Flash Player. Firstly, open the Chrome Browser and go to Settings. Scroll down and click on Advanced. Now, click on Content Settings from the Privacy and Security Section. 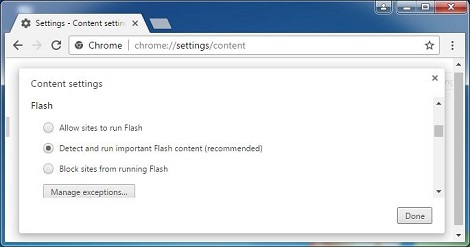 Click on Flash and enable “Allow sites to run Flash” and also enable “Ask First”. To check its version, enter “chrome://components” in the URL tab. If it is not updated then click on the check for updates tab. That’s all about how to Enable Adobe Flash Player. Further, for more information related to flash player visit our website APKPie.